Take a look at the Grand Theft Auto 5 Collectibles locations guide wrap up, so you can find all Grand Theft Auto 5 Collectibles in the new open world action-adventure game on PS3 & Xbox 360. From hidden Spaceship Parts to Confession Letters, Nuclear Waste Barrels, Stunt Jumps and other map locations to find even more unlockables. There’s lots to collect and you will be rewarded in-game for each new discovery. Grand Theft Auto 5 Spaceship Parts Locations Guide. Grand Theft Auto 5 Letter Scraps Locations Guide. Grand Theft Auto 5 Hidden Packages Locations Guide. Grand Theft Auto 5 Weapons Guide. Grand Theft Auto 5 Vehicles Guide. Grand Theft Auto 5 Stunt Jumps Locations Guide. Grand Theft Auto 5 Nuclear Waste Locations Guide. Grand Theft Auto 5 Submarine Parts Locations Guide. Grand Theft Auto 5 Map. 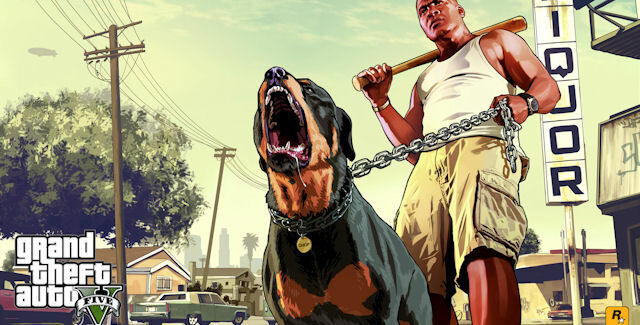 Tip #1: Franklin’s rottweiler dog Chop can hunt for nearby collectibles, while you’re walking him outside, by pressing the RT button on Xbox 360 or the R1 button on PS3. Tip #2: If you have the iTunes Chop App — you can download the iFruit app onto your personal smartphone or tablet — your “Tamagotchi” dog Chop can help find collectibles (from Letters to Spaceship Parts). Whistle to Chop to come to you and bring up the Menu Select “Make Chop Hunt”. If a collectible is within reach, he’ll go running for it. Follow him to get the collectible item. Which collectibles are you chasing down in Grand Theft Auto 5?